The America’s Cup village looked forlorn on Wednesday, Day 3 of the challenger semi-finals. The 30-knot gusts that had forced racing to be canceled had the few visitors—most of them from the massive cruise ship docked alongside—chasing their hats across the asphalt and blew the froth off their beers. The teams’ hangar-sized workshops were buttoned up tight, as shore crews repaired the damage from a hectic Day 2 of the challenger semi-finals. It had been a day of high drama that culminated in Emirates Team New Zealand burying their AcC50’s bows and pitchpoling of the capsize] in the high winds that caused varying amounts of damage to all four boats on the course. If this was a gift to the Kiwis’ opponents, Sir Ben Ainslie’s merry men on the Land Rover BAR boat, it was gratefully received. On Monday, the Brits had forfeited both their races to the Kiwis when their wing controls developed problems. Being beaten in the first of Tuesday’s races added to insult to injury. Meanwhile, their British opponents, eager to have a tilt at a weakened foe after their own troubles, fidgeted morosely. As a guest of the Land Rover BAR team, I could feel the air of disappointment in the luxurious sponsor’s lounge where the black and grey uniforms of the shore and sailing team blended into the life-size photos of the crew along the walls. In a sailing world where good sponsorship is both hard to come by and usually involves a more or less strict financial arrangement, the partnership between Ben Ainslie Racing and the Land Rover group runs deeper. Chatting with Ian Anderton, who’s in charge of aerodynamics for Land Rover, I learned how the carmaker’s massive computing resources were put at the disposal of the sailing team to help analyze sailing loads and refine the massive wings and foils that propel these boats to such amazing speeds—on the gusty Tuesday, Land Rover BAR had been clocked at 48 knots. In return, Anderton told me, the Land Rover designers had learned from the fluid dynamics experts in the sailing team. The slow-moving front that dogged racing midweek had passed overhead into the Atlantic by Thursday morning and the change in energy and atmosphere was palpable. The Land Rover base was abuzz with excitement. The meteorologists predicted 14-16 knots from the southwest, and the boats would ride high above the slight popple on the water of the Great Sound. In other words, even if the wind built a little later in the day, the conditions looked close to perfect. Champagne flowed on the Land Rover boat, packed with sponsors and spouses, as we made our way onto the sound. 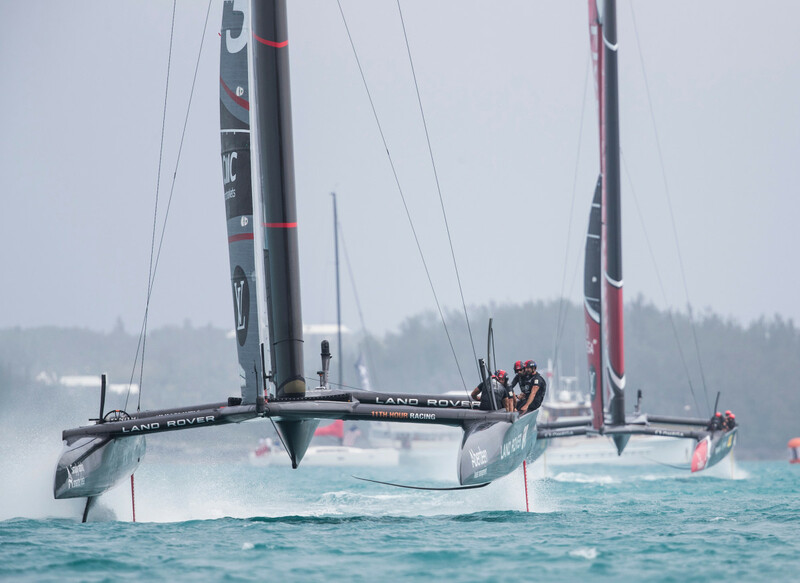 With the Kiwis only needing to win two more races while Ainslie and crew needed four to take the best-of-five series, the odds were stacked against them. But if the dramatic events of the preceding days proved anything, it’s that it ain’t over till it really is over. The Oracle comeback in San Francisco has become a rallying cry to the underdogs of the world, and the Brits always like to see themselves as the underdogs. We raised a huge cheer as the black boat sailed close by our lumbering spectator boat on its way to the starting box, and yet another one as the Brits put the pedal down and scorched out of the gate at close to 40 knots, while the Kiwis seemed to have the parking brake on (turned out they were struggling with a sticky daggerboard). The cheers gradually faded away, though, as Burling & Co. put on a foiling masterclass, coming from 400 meters behind to pick Ainslie off with clinical precision and leave the Brits in their wake. It was a rare treat to be able to watch the racing on the spectator boat’s TV and then look out the window to see the boats blasting by a few hundred yards away. In no time the score had become now 4:1, and the end was in sight for the Brits. And yet… that thing about it not being over till it’s over.… In the second race, Ainslie won the start and it was the Brits’ turn to sail a near-flawless race, shutting Burling out at every mark for a deceptively easy win. Four-two! The popping of champagne corks built to a crescendo on our spectator boat. In the end, though, while I was somewhat conflicted, as a New Zealander with strong ties to England working for an American sailing magazine, I was still relieved to see ETNZ put on yet another commanding performance in the final race to extinguish the last faint gleam of hope for the Brits. As always, the British were magnanimous in defeat. They had exceeded the expectations that most outsiders had of them, even if they had fallen short of their own. Buoyed by the announcement that afternoon that Land Rover and most other sponsors had committed to extend the partnership through another Cup campaign, the team gathered for their families, friends and supporters together in the Landrover lounge for their final party of this America’s Cup.